A tech entrepreneur from Exeter has developed an innovative dashboard for care home owners to record important information and prove they are achieving assessment standards, subsequently facilitating improved quality of care and increasing profitability. 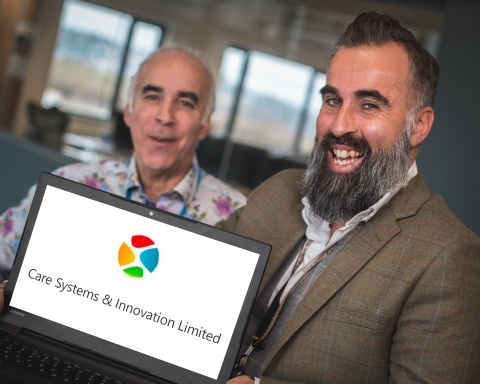 Twenty years’ experience in IT and almost a decade’s experience in the care home sector provided the foundation for Barnaby Griffith’s business venture, Care Systems & Innovation (CSI). Mr Griffith chose Exeter Science Park to launch his new business because of its networking and investment opportunities, as well as its close proximity to the M5. Recognising the pressures facing care home owners as well as the requirement for comprehensive record keeping in order to fulfil complex and detailed assessment criteria, the 40-year-old created the software package to help managers record and present important data as part of a single dashboard of information. The “compliance dashboard” means busy managers can show they have met the regulatory standards set by the Care Quality Commission (CQC) in a simply presented format. Mr Griffith hopes this will improve compliance and standards of care. For the last nine years, Mr Griffith and his father Dennis have run Langford Park nursing home, Sainthill House care home and Sainthill Cottage for people with learning disabilities, near Exeter. Concurrently, Mr Griffith ran a software development and design company, which subsequently became CSI, the first software provider to offer such a comprehensive data recording package for care homes. Mr Griffith has been working closely with Devon County Council and is an elected member of the Provider Engagement Network for residential care services throughout Exeter and East Devon and has tailored his software to meet the council’s requirements for care homes. “We had developed an extremely successful software programme to use in our care homes and we wanted to be able to offer this to other care homes,” he explained. “The adoption of IT systems is widespread but there are multiple providers addressing isolated activities, and not in alignment with the regulator’s assessment criteria. “None of the systems have all the information required to provide one single picture of CQC compliance, so this is why we developed CSI software. The team of four moved into the Science Park in August and is already reaping the benefits of working under the same roof as other analogous industry professionals. Mr Griffith was also keen to be part of the SETsquared Partnership, an enterprise collaboration between the universities of Exeter, Bristol, Bath, Southampton and Surrey which supports high tech business start-ups such as CSI. As a result of the Partnership’s support, CSI became one of only 20 companies nationwide to present at the 15th annual Accelerating Growth Investment Programme in London in early December. The investment showcase event gives companies the opportunity to present to investors and receive a programme of support. “There is a great atmosphere here and there are great networking opportunities,” continued Mr Griffith. “We’ve been invited to lots of events, and we wouldn’t have been able to present in London if it wasn’t for being at the science park. Joe Pearce, Head of Business Support at SETsquared Exeter and Exeter Science Park, said: “CSI is a fine example of how business incubators such as SETsquared can support start-ups and allow them to grow and develop into a thriving business. For more information about the Exeter Science Park visit www.exetersciencepark.co.uk, call 01392 247047 or follow Exeter Science Park on Twitter @ExeterSciencePk or LinkedIn.